In Stockholm, there's traditionally a Christmas market the last two weeks before Christmas. According to an encyclopedia, it can be traced back to the 1520s. I came across a few pics of it drawn in the 1860s by different artists, and wanted to make my own mini version. This photo shows a temporary setup. Eventually, I want to extend the scene into a small Christmas market, with a couple more stalls and a lot more people. 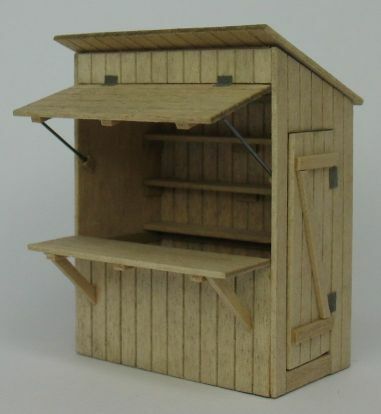 My plans and directions for building market stalls like this in any scale appeared in the Swedish mini magazine Miniatyrvärlden in issue #3, 2007. Fabrics are sold in my stall, mostly because I had a deadline to meet and the fabric bolts were quick and easy to make. The dealer is advertising her goods with a sample hanging from a pole at the side of the stall. An 1860s account by an English visitor to Stockholm mentions some goods sold at the market - Christmas trees, toys, gingerbread and Christmas buns, and cheap items suitable for gifts or for decorating the tree (including sweets and Christmas crackers). In that same account, a person remarks that the Swedish homes were decorated with trees and candles for Christmas, but never holly and mistletoe as these didn't have any Christmas connotation to Swedes (and both are very rare here anyway). Nor had Christmas cards been introduced here by that time. Market stalls and street vending have long been a low-cost alternative to owning or renting a shop. In the countryside, markets were held a few times yearly, to give the farmer population a chance to buy what they needed. 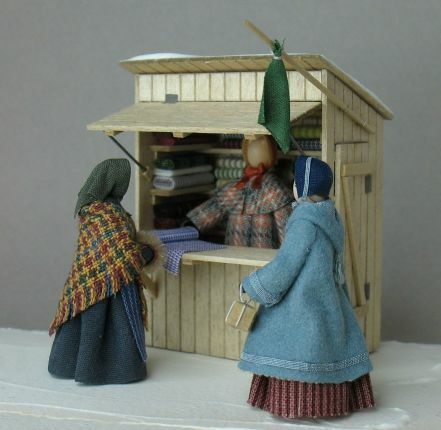 In towns, markets catered to the townspeople's needs. I've read that all over Western Europe street vending was regulated by laws, and at least in Stockholm, Sweden, you had to have a permit and pay a yearly fee for it. Here, only women who had to contribute to their family's economy were eligible for a permit (often widows or poor wives). There were restrictions on what they could sell, so that they wouldn't compete with other professions. In 1847, the rules allowed them to sell e.g. fresh flowers, berries, chocolate, fish, meat, sausages, pigs and poultry, fruit and vegetables, milk, cream, fresh butter, candles, gingerbread and all kinds of pastry, eggs, jam, cold cooked food, and bread.